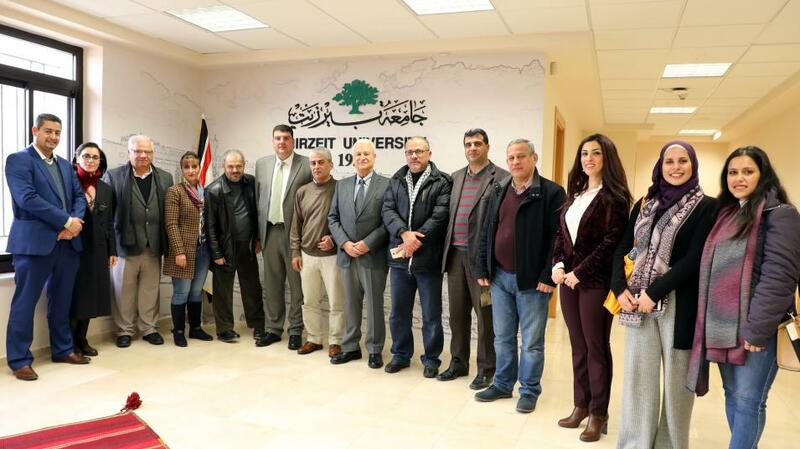 The Cooperative Association of Governmental Staff for Savings and Lending will assist in paying the tuition fees of Birzeit University students whose families belong to the association according to a new agreement with Birzeit University signed on February 7, 2019. University president Abdullatif Abuhijleh and Osama Abu Karsh, head of the association, signed the agreement in a special ceremony attended by the university’s Vice President for Administrative and Financial Affairs Mirvat Bulbul, Assistant to the President Aziz Shawabkeh, Dean of Student Affairs Mohammad Al Ahmad, Director of the Office of Grants and Contracts Amir Khalil, Acting Director of the Advancement Department Nadine Sinokrot, and Manager of the Students Financial Aid Unit Fairouz Darwish. Abu Karsh introduced the association that engages in endeavors rooted in the values and ethics of community service. He stressed the importance of community work and of community-based financial cooperatives that are not driven by commercial considerations but strive to advance the social and economic prosperity of the community.